This is one of my favorite salads during the holiday season. The cranberries just make it so festive! Feel free to use light mayo and sour cream — it is just as delicious. 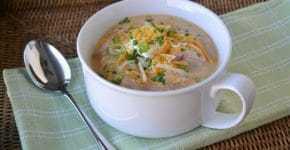 In a small bowl mix ½ cup mayo, sour cream, lemon juice, soy sauce, curry powder, kosher salt, and pepper. 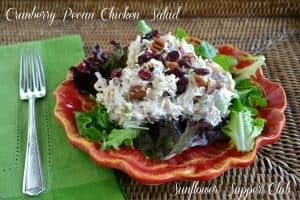 In a medium bowl, combine the chicken, celery, green onions, dried Cranberries, and toasted pecans. Gently mix in the mayo mixture. Add the remaining ¼ cup of mayo if the salad is not as creamy as desired.